It does not take long to see the determination behind Jenna Wiegand’s wide smile. As she talks about the topics she is most enthusiastic about, finance and sustainability, it becomes clear that these are expressions of an underlying passion for global change. And in spring, 2014, Wiegand, a third-year Honors College and College of Business student majoring in management and sustainability, was recognized for this commitment with a nationally-competitive Udall Scholarship. The Morris K. Udall and Stewart L. Udall Foundation was established by the U.S. Congress in 1992 to support scholarship, fellowship, and internship programs that promote environmental and Native American issues. Wiegand is one of 81 U.S. students to receive a $5,000 undergraduate scholarship in the program this year. 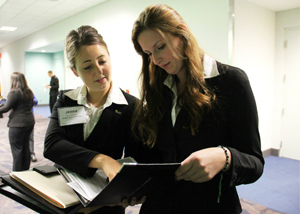 At the national expedition, Enactus teams present their projects from the past year. In 2013, Wiegand and the Oregon State University chapter worked on a new food pantry in Hebo, Oregon; a sports league for children elementary school age and younger who have disabilities; and microloans to Nicaraguan business owners. This latter project, microloans, is one particularly close to Wiegand’s personal ambitions. Her dream, she said, is to create a microfinance company – a company that gives small loans to residents in developing countries so they can start their own businesses – in Haiti or Jamaica. This summer, she is considering doing an internship with a Nobel Peace Prize-winning microfinance company in Bangladesh, The Grameen Bank. “I’d be a little nervous to live by myself there and do the whole new-currency thing, but my parents are more nervous about it than I am,” she says. To Wiegand, one of the key issues in places like South Caicos is making sure that the people who live there have the ability to participate in the changes that impact their livelihoods and environment. “Development is coming, and it’s a little bit ‘like it or not,’” she notes, “but [the people who live there] could have a say in it. It’s important to give them a voice so they can tell their government what they want and don’t want to see on the island.” Microfinance is one mechanism of helping people become economic participants. 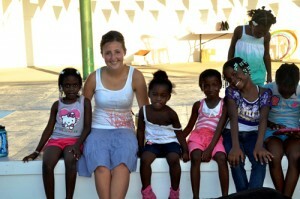 Wiegand is working now on translating her experience in South Caicos into her University Honors College thesis. Parallel to this academic approach, she is also writing a personal reflection of her trip, “how it changed me and made me evaluate myself as a person,” that she plans to publish as an ebook using a program she learned about in a digital humanities colloquium offered through the Honors College.